All Inclusive Vacation Tips. The Travel Insider Shares Our Favorite Tips And Techniques To Save Money And Making The Most Of Your All Inclusive Vacation. Here is the latest list of our tips and techniques for making the best of your next all inclusive vacation. We have compiled a list of tips from various sources including our own clients and staff. Price is often relative to quality. If it seems too good to be true, it probably is. However, sometimes it's possible to get an amazing—and legitimate—deal, as long as you're looking in the right places. Look for deals. For example, both Couples and SuperClubs offer "surprise" packages. In exchange for deep savings, you waive your rights to choosing the resort you'll be staying at. This is a good way to save if you're not picky. Check our web site for details. See what's on sale link below. Jump in feet first. In other words, know what you're getting into. Check to see what's included in the price, so you don't incur any additional costs that you're not prepared to pay for. Don't go for the steak if you really just want the hot dogs. There's no point in paying for things you won't use or do, so take that into consideration when evaluating packages. Always have a way out. Ask about cancellation policies, and look into travel insurance, especially if you are booking through an online agency. Purchase a good, general guidebook to the Caribbean, and visit related web sites. Learn as much as you can about the Caribbean islands Visit discussion groups and ask for recommendations from others. Decide on a time of year for the trip. Hurricanes are common in late summer and fall. Travel is cheaper in the "off-season." Who will be going? Are you going alone, with a friend, or with family or children? Be sure to include them in the decision-making process. Ask yourself what your favorite activities are. What are preferences of those accompanying you? The island you select should have those activities available. Ask yourself what style of vacation you prefer. Do you want luxury, with all your needs attended to? Or do you prefer to "do it yourself"? Different islands have different activities and accommodations available. Some have great shopping, others have great mountains, most have great beaches. Water sports vary by island. Now you have a good idea of what you want. Island styles differ. Like privacy? Try islands with romantic hideaways. Like keeping busy? Try islands offering shopping, casinos, lots of sports, or with larger, more cosmopolitan centers. Select three to five islands that meet your requirements. Compare accommodations and activities on each island. Ask friends for more recommendations. Visit forums and chat groups to learn more. If you're still not sure, ask your travel agent to help you select a destination. Explain your requirements and the agent should be able to suggest an island or two. Saving money on your next trip. Start planning early. Many resorts book up months in advance, particularly in high season (October - April for the Caribbean, usually). If you're traveling in the hurricane season, investigate travel insurance or avoid islands in the usual hurricane paths. If price is an issue, look for package deals or try an auction online to save money. Some islands are more expensive than others. You'll find better deals when the kids are in school. Prices are lower with less competition. Is the all inclusive vacation right for me? Will I take advantage of all the resort’s activities, entertainment, and facilities? If the answer is yes, still price other a la carte options in the area to make sure you’re not paying more than you should at the resort. Regarding cuisine, note that a resort may have several dining options to choose from, typically three to five on-site restaurants, whereas local restaurants may offer countless options that could be a better value. Will I want to spend most of my time at the resort, or will I want to explore the local area? If you are more interested in going local, check area hotel rates to see if you can save more by booking basic accommodations. Do I want to be by myself, or do I want to meet new people? If you’d rather be by yourself, a resort is likely not for you. Resorts, by their very nature, foster social situations. If you want solitude and still want to stay at a resort, check out spa/heath/wellness resorts, as well as those that don’t cater to families or feature wild nightlife. What’s not included? Some all inclusive resorts will include your food, however if you want drinks from the bar you pay extra for them. Or, it might be sailboards are free but you have to pay extra for horseback riding. It’s good to know up front what those costs are. What kind of vacationer does the resort serve? If you’re a family of six, you don’t want to end up at a honeymooners’ resort. It’s unlikely a travel agent or a resort would let that happen, but ask nonetheless to ensure the resort caters to people like you. How many meals? Confirm how many meals are included, and what the process is for making reservations for those meals. Some resorts limit the number of meals, or require a complex process to reserve at on-site restaurants. Domestic alcohol only? If you’re a connoisseur of fine vodka, ask whether premium alcohol is included. Some resorts consider “all inclusive limited to domestic brews. Buy complete with airfare, or not. If you’ve got frequent flier miles you can redeem, or know of a great discount airfare to the destination, consider booking your airfare separately. Packing tips for your all inclusive vacation. Make a simple list of activities you want to enjoy and places you want to visit. Sometimes a good tour book on your destination can be a big help. Acquire clothing and accessories for the activities on your list. Activities like hiking or tennis require special footwear or clothing. If you're trying something new, check with local specialty shops for advice. Research your particular destination. The Caribbean is tropical, but some islands are very windy, and you may want rain gear, particularly if hiking. Dress requirements differ by island culture and activity or resort. Consider luggage requirements for air travel or cruise. Plan to stay well within limits so you'll have space for souvenirs you'll want to pack for the return trip. Select your luggage pieces. Open them up and observe the space you'll be packing. If you have special gear, where will it go? In its own piece of luggage, or in with your personal items? Most people pack far more than they need. Plan your packing with specific limits to numbers of items. Take enough, but don't go overboard. Lay out your supply of different items and begin to arrange them in your luggage. It's best to lay out everything you're planning to pack before starting to fill a suitcase. Bring at least 2 swimsuits. They dry slowly in humid tropical air. With 2, one can dry while you're wearing the other. Bring a good cover-up or (for women) a wraparound skirt can be useful. Bring a hat with a brim to help protect you from the strong tropical sun. And pack some good sun block to protect yourself from sunburn. Don't forget your sunglasses. The best clothing fabrics are lightweight. Try to select garments that are sheer, Spandex/Lycra, cotton, or knits. These fabrics require little ironing, dry quickly, and can be folded into small parcels. A good pair of sandals with non-slip soles is useful to have along. Sand shakes out easily and they can double for dress. Rubber soled shoes (like walking or tennis shoes) are another good addition. Bring only the toilet articles you'll really need. Pack spillable items in plastic bags. Pack some extra plastic bags for wet items and pack shoes in plastic bags. Roll clothing when possible to conserve space. Bring that great book you've been dying to read. The Caribbean can be very relaxing and you'll finally have time to read it. Most hotels have towels for your use, but if you have space, roll up your beach towel and pack it. You'll be glad you did. Pack your passport or other identification. Be sure to bring necessary medications and copies of prescriptions or other documentation from your physician. What are you looking for? We are here to help. Is fun in the sun on your agenda? Beaches are the one thing that most people look for right? So let's start in Aruba. Arbua's Palm Beach is one of the most popular Caribbean areas for boating, water fun, and more! Next stop might be the Cayman Islands Seven Mile Beach, renowned for its crystal clear waters. Also of note are the beaches of the Dominican Republic, Jamaica's Seven Mile Beach, and Puerto Rico. Solitude. Are you looking to escape for some much needed rest and relaxation? Try Little Cayman, Turks, or Caicos. Excitement. If you're more of a party animal and are looking for some night owl excitement, the casinos, bars, pubs, restaurants, shows, and music of the Dominican Republic, Jamaica, Aruba, and Puerto Rico are just where you should be found after the sun goes down. Sports. Perhaps your idea of fun is getting wet and sweaty? Sporting locales that boast scuba diving, fishing, sailing, golf, snorkeling, tennis, and more include the Dominican Republic, Puerto Rico, Jamaica, Aruba, and the Virgin Islands. Family Fun. The whole crew can find activities for all ages at resorts in Aruba, Grand Cayman, Jamaica, and Puerto Rico. Romance And if what you're really after is a moment of quality time with someone special, check out some of the luxurious offerings in Anguilla, Dominica, Jamaica, St. Lucia, Puerto Rico, and St. Croix. Like in the US, booking tickets and hotels in advance will get you the best value on your Mexican vacation. By planning your Cancun hotels and destinations months ahead of time, you can save up to 40% of your total. 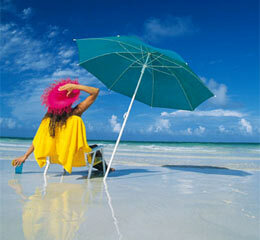 When setting your Mexican agenda, check out all the discount travel portion of our web site. Most places are much more comfortable selling out their destination's availability in advance, and will offer you incentives including rate cuts, taxi vouchers, and more if you lock your reservation in. It makes your trip cheaper, and makes the hotel occupancy rates go up so they can charge all those last-minute travelers the extra money. When To Travel South of the Border. Most of us know about the hurricane season in the Caribbean Islands, but when is the best time to travel to Mexico which isn't necessarily subject to the same issues? Most people enjoy Mexico the most between late September through late April(Don't forget that the February through March time frame is the favorite of Spring Breakers). Inland Mexico does have cold weather as well, which is something to consider if you travel in the winter months. You may want to avoid the resorts in August since that is a very popular time for European tourists to travel and the resorts a much busier. Think about the climate you enjoy the most before you choose your destination and your time frame when you plan your Mexico vacation. The coast is hot and humid and perfect for beach goers while the higher elevations inland are more arid.